I was in a funk today and needed to snap out of it. I love making dulcimers but making dulcimers is also one of my jobs and I needed a break from working so I decided to go for a drive. I was “so inspired” today. It is easy for me to spend time tweaking and tuning up wonderful old tools. Tools are functional objects of beauty and each will have a unique personality to contribute to my work. Perhaps my relaxing hobby is exploring the history, form and function of the tools I use in my work. Today I came across three tools that talked me into taking them home. 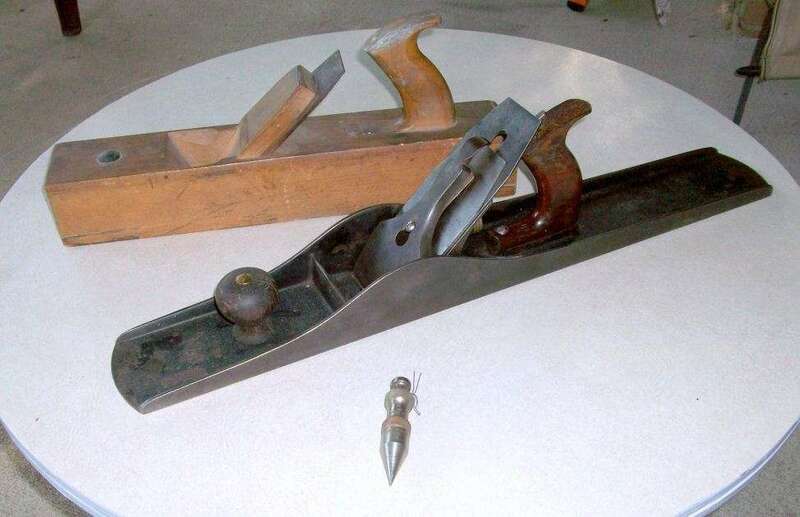 The first was a Stanley type 11 #8C jointer plane in very good condition. Yes, I have a #8 but it isn’t a type 11. Now I have one that matches my type 11 #7. That must be important, right? The second tool to not only jump off a shelf but follow me down the aisle was a Ohio Tool Company wooden jack plane that just needs a little cleaning and sharpening. I have another similar wooden jack plane but the mouth on it is so tight I use it as a smoother. This one will be dedicated to rougher work. Then an unmarked plumb-bob caught my eye as I walked by. I politely asked it to give me my eye back but it said it would only do so if I took it home. I thought it best to go along with its wishes. I have no actual need or use for this plumb-bob nor do I have a need or use for the other 3 or 4 I own. I tend to hang them from things around the house so I always have a reminder of where the floor is. I usually end up selling , trading or giving away tools as I find some I prefer to what I have been using but sometimes that process takes a while. It is always hard when they leave the nest. Did I really need any of these tools? No. Did finding them and thinking of the joy of working with them make me feel better about life, the universe and everything else. Yes! The cost of these tools was very reasonable and much less than what I would have paid for a good massage or any other therapeutic intervention. Time to get back to work and make dulcimers! Yay! Well, the plumb bob may end up being more useful for dulcimer making than the 2 person crosscut saw I once came home with! See you on Linkedin when you find the password! A friend suggested I sign up there. Just what I need; more time on the web! Right… so the plumb bob is used for what in dulcimer making? BTW… soon as I remember my Linkedin password, I’ll ok your invite! It’s really good to keep track of where the floor is. I’m glad you have a new plumb bob. Makes planing much safer. @Deborah RobsonKnowing where the floor is makes many things in my life safer!